Node-RED is a switchboard for the Internet of Things, a visual tool that helps you connect your favorite apps, websites, and hardware together to do new and useful things. Most often compared to IFTTT or the late Yahoo Pipes, Node-RED has a much more powerful and flexible interface, and a large open source community creating nodes to interact with a wide variety of apps and services. In this tutorial, we'll install Node.js and Node-RED, get an SSL certificate from Let's Encrypt, and use Nginx to handle secure connections for Node-RED. One Ubuntu 16.04 server with a non-root sudo user and basic firewall set up by following this Ubuntu 16.04 sever setup tutorial. For this tutorial, we'll use a user called sammy, but of course you can choose whatever you like and substitute as needed. A domain name pointed at your server, as described in How To Set Up a Host Name with DigitalOcean. This tutorial will use node-red.example.com throughout. Let's Encrypt installed, and a certificate generated for the domain you configured above. How To Secure Nginx with Let's Encrypt on Ubuntu 16.04 will walk you through the necessary steps. You can ignore the steps regarding Nginx configuration (steps 3–5), as we'll cover that here. Just make sure you get a certificate successfully issued, and set up the cron job to handle automatic renewals. Ubuntu 16.04 makes it easy to install the latest long term support (LTS) release of Node.js because it's included in the default repository. The command installs Node.js v4.2.x LTS (long term support), which means the Node.js Foundation will continue to support this version for 30 months from its release date of October 12, 2015. Note: It's important to install the -legacy version of the package because Node-RED's startup scripts expect your Node.js binary to be named node, but the standard package uses nodejs instead. This is due to a naming conflict with a preexisting package. Verify that the installation was successful by checking the version. Node Package Manager (npm) helps you install and manage Node.js software packages, and we'll use it to install Node-RED. Install npm using apt-get. If it prints a version number without error, we can continue on to our next step, where we'll use npm to install Node-RED itself. Use npm to install node-red and a helper utility called node-red-admin. After a bit of downloading and file shuffling, you'll be returned to the normal command line prompt. Let's test our install. First, we'll need to open up a port on our firewall. Node-RED defaults to using port 1880, so let's allow that. And now launch Node-RED itself. No sudo is necessary, as port 1880 is high enough to not require root privileges. Some "Welcome to Node-RED" messages will print to the terminal. On your computer, point a web browser to port 1880 of the server. In our example, that's http://node-red.example.com:1880. 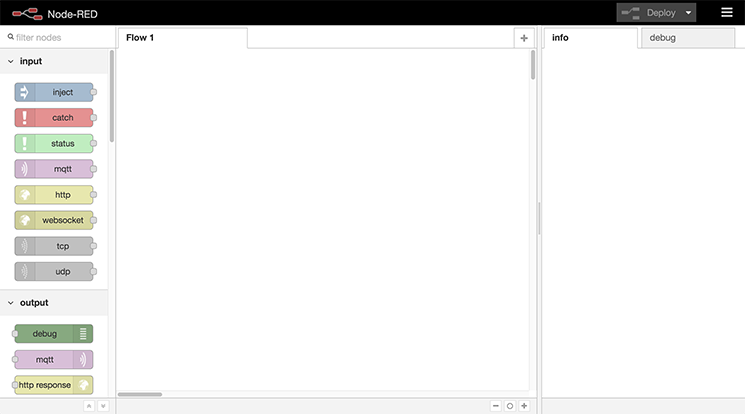 The main admin interface of Node-RED will load. If it worked, you can type CTRL+C in your terminal to shut down Node-RED and return to the command prompt. We've installed Node-RED successfully and tested it out, so next, we'll set it up to launch during system startup. In order to start Node-RED automatically on startup, we'll need to install a node-red.service file instead of the more traditional init script. This is because Ubuntu 16.04 is the first LTS release that uses systemd for its init system. You can find a summary of this and other Ubuntu 16.04 changes in What's New in Ubuntu 16.04. Open a blank service file called node-red.service. Copy and paste in the following, then save and close the file. A full explanation of systemd service files is beyond this tutorial, but you can learn more by reading Systemd Essentials: Working with Services, Units, and the Journal. This describes our service and indicates that it should be started after networking and syslog are functioning. ExecStart is the command needed to start our service. We call node-red-pi instead of plain node-red so we can pass some memory-saving options to Node.js. This should allow it to run well on any reasonably sized server, depending of course on how many flows you create in Node-RED (and how complicated they are). Restart=on-failure means systemd will try to restart Node-RED if it crashes, and KillSignal tells systemd the best way to quit Node-RED when it needs to shut down or restart the process. This sets the label used when logging, and logs all output to the syslog service. We want to run Node-RED as our non-root user. The lines above tell systemd to launch Node-RED using our user and group, and from within our home directory. WantedBy indicates the targets our service should run under. In this case, when Ubuntu boots into multi-user mode, it will know to also launch our Node-RED service. Muti-user mode is the default startup target. Now that our service file is installed and understood, we need to enable it. This will enable it to execute on startup. Let's manually start the service now to test that it's still working. Point a browser back at the server's port 1880 and verify that Node-RED is back up. If it is, shut it back down until we secure the install in the next step. We're going to use Nginx to proxy the Node-RED service. This means Nginx will handle all of the SSL connections on port 443 (using the Let's Encrypt certificates you previously set up), and then pass the traffic along to Node-RED. Oopen a new Nginx configuration for the site. Save and close the file. Let's explain what this file does. The first three lines tell Nginx what ports to listen on, and what domain name to respond to. The ssl_certificate and ssl_certificate_key lines point to the certificates we retrieved from Let's Encrypt. The remaining ssl_ lines choose protocols, ciphers, and options that are more secure than the defaults. location / starts the block where we actually define our Node-RED proxy. This block will match any plain, non-secure http connections, and redirect them to the https version of the site. We point to our Node-RED service here. It is available on localhost, at port 1880, so we pass connections to it there. The remainder of this block of configuration sets some headers that are important for proper proxy functioning. The Upgrade and Connection headers are especially important for handling Node-RED's websocket connections. Reload Nginx to pick up the new configuration. Once again, navigate to your server: http://node-red.example.com. You should be redirected to https://node-red.example.com (note the https) and see the Node-RED admin interface. This means we're now proxying Node-RED through Nginx. We just have a few more tweaks to lock down Node-RED, and then we'll be finished. You will be prompted for a password. Type it in, press ENTER, and a hash will be printed on screen. Copy that to your clipboard and open the Node-RED settings file. Scroll down and uncomment the adminAuth block (by removing the "// " in front of each line). Change username to whatever you like, and paste the hash into the password field. While we've got the file open, uncomment the uihost line as well by removing the // at the front of the line. This means Node-RED will only listen on the local interface, and wont be reachable directly by the outside world (it will only be accessed through the Nginx proxy). You can now save and close the file. Update the firewall one last time, just to make sure Node-RED is never directly accessible. 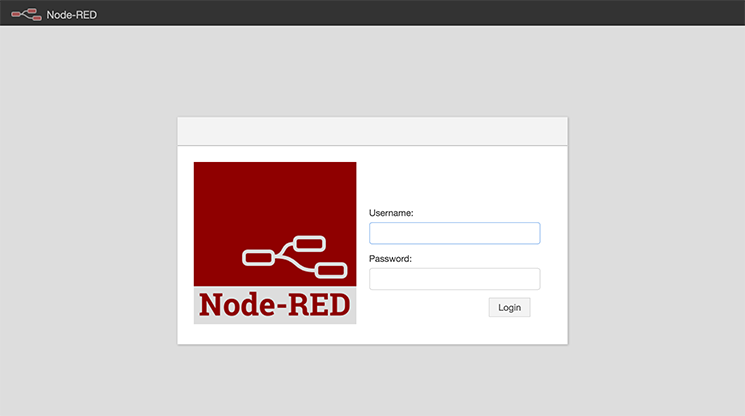 Navigate to https://node-red.example.com and you'll see a login screen instead of the main editing interface. If your site is showing a login screen and an https connection, you've set everything up correctly. We now have a reasonably secure installation of Node-RED, being proxied by Nginx using Let's Encrypt for its SSL certificates. Log in and get wiring! There is much more information and project inspiration available at Node-RED's website.